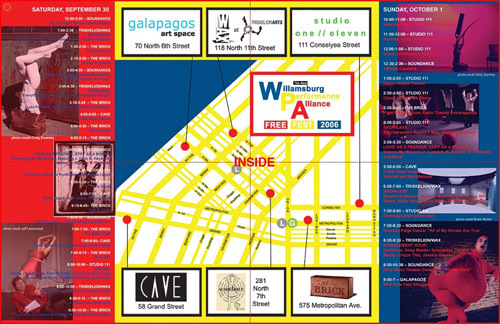 Check out the WPA Free Fest in Williamsburg today (9/30) and tomorrow (10/1). The WPA Free Fest is put on by the Williamsburg Performance Alliance--which is a nod to a different WPA, the Depression-era Works Progress Administration--and offered free of charge at different venues in Williamsburg. Click here for the full schedule. Performers include ABADACA CAPOIERA, Abby Bender & Schmantze Theater’s ZOO, Anabelle Lenzu, Andrew Dickerson/Cirque This, Audrey Crabtree, Bryon Carr, Cassie Terman, Cate McNider, Danyon Davis, Dirty Steve, Eric Davis, Everything Smaller, Fly-by-Night Dance Theatre, Gillian Chadsey, Groove Mama, Heather Harpham, Heather McArdle, Hilary Grubb, Jackie Moynahan, Jessica Gaynor, Julie Kline, Juliette Mapp, Leigh Evans, Marisa Beatty, Marisa Grunberg, Noel Mac Duffie Dance, Phil Alexander, SIX CHARACTERS, Stephanie Sleeper, Tanya Calamoneri, The South Wing, Vanessa Paige Dance, Victoria McNichol Kelly, Will Rawls, The Bitter Poet, Cole Kazdin, Trav S.D., Debby Schwartz, Jonathan Latiano, Chris Harcum and Michele Carlo. It's true that we don't know what we've got until it's gone, but it's also true that we don't know what we've been missing until it arrives.